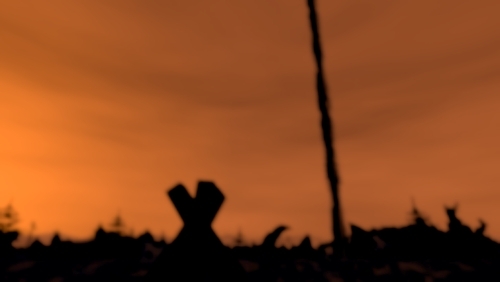 In the final release, there won't be only full Namalsk Crisis campaign, but i will also add unique MP mission called Namalsk Crisis warfare. It is a classic CTI mission designed for Namalsk, but with some major changes, which are close as possible to campaign story. For united forces of USA and Russian Federation it will be a tough fight against the NAC (same as in the campaign), the NAC have prepared in the warfare mission full of advantages. First, the NAC faction have from the beginning captured key positions on Namalsk - A1 object, AII object with underground and also Brensk railway station. NAC have mostly Russian equipment and armor (taken from the huge EMP), but their units have also some versions of G36's or thanks to the NAC's researches they can also use dangerous beta-version of their weapon called ER7 RFW. But probably the most powerfull weapon, which the NAC having, is their key object - A1 - strange unknown alien device. Experiments on it are very dangerous and thanks to that, they managed to use this device as a weapon against intruders of Namalsk. One of the its effects - device is emitting to about 10kms long perimeter about Namalsk strange kind of the radiation, which have very bad impact on the human brain. Against this radiation, the NAC have managed to create protection device called APSI. But this is not all - with a proper setup of the incoming power into the device, it can generate EM pulse, which can completely shutdown every equipment on Namalsk. Against this EM pulse it is very hard to protect equipment. 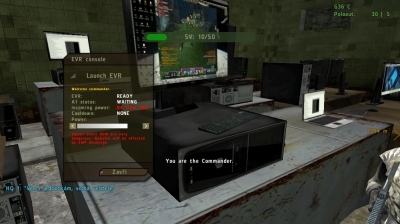 This device can control only NAC faction, key control console is placed in the underground of the AII object in one of the secondary NAC control stations. Through this console can every NAC member look, in which status is A1 device currently. But for controlling it, you need to be NAC commander (warfare commander, which can place buildings in the base etc.). On this picture you can see the basic console, which is used to access A1 object. The most important parrt of this dialog is slider for incoming power to the device, You can change heavilly upcoming progress in the mission thansk to this slider. Higher values means more troubles, console will warn you and describe, what will happen in chosen value. This console is connected directly with Blowout module, you can find more information here. 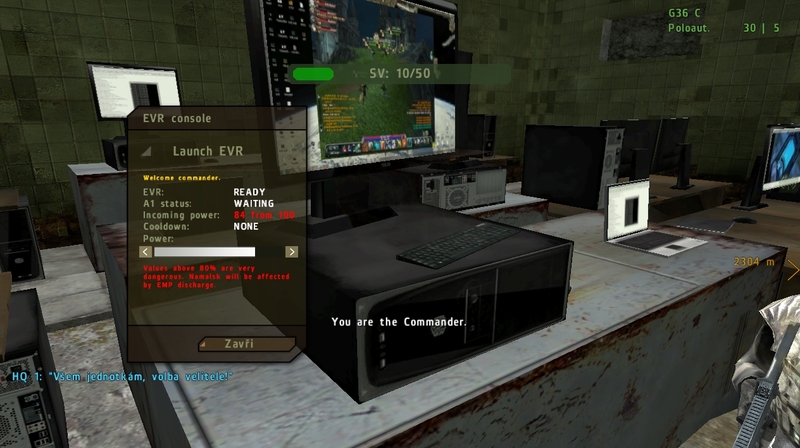 As the NAc commander, you can use Launch EVR button, which will start EVR sequence (device will start working). This console will also offer info about device cooldown. After every sequence device need some time to recharge and prepare for next sequence, you won't be able to use this console through cooldown time. Device cooldown is about 7 to 12 minutes, depending on the incoming power. As i said, this console is located in one of the NAC's secondary control station in the underground of the AII object, which is from the beginning guarded by NAC units. The whole underground is changed using AII module, which spawns misc objects to the underground and also controlling lights there, so, you don't need to have night vision during your visit there. And for adding some balance, i added option for West side (USA and Russia units), they can also manipulate with A1 device - but through sabotage. They can sabotage from the same position as the NAC side can control their device. So, west side need to get there first in order to do sabotage. After successfull sabotage, nothing happens immediately, but if the NAC side will decide use device again, power input sabotage will be launched and the device will be inactive for c. 30 minutes. And as a small bonus, i added well known Namalsk postprocess efects to this warfare, check team menu and FX #. So, we have here united forces of USA and Russian Federation, trying to stop NAC and their experiments and the NAC, which are trying to hold Namalsk and their researches with everything. To which side you will join? It's up to You!